Television lovers and industry stakeholders have over the period been grousing over the dominance of Indian telenoleva, ‘Kumkum Baghya’ at the detriment of local productions but interestingly, the chatter has shifted in the last couple of weeks to a local production – www.entertainmentgh.com can state. “Kejetia Vs Makola” is an urban satirical show and a subversion of the Law Procedural genre. 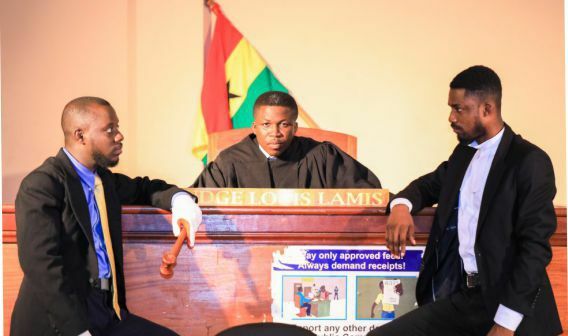 The first of its kind on Ghana TV, it follows the amusingly unconventional legal battles between a band of misfit lawyers claiming to have been trained in law at a certain Ghana School of The Law somewhere at Kejetia and their colleagues from Ghana School of Law at Makola. The show is generating all the rave reviews and interesting banter on social media especially, and for the first time in the 2 or so years of ‘Kumkum Baghya’ dominance, the attention is all fixated on a local production. Invariably bizarre and outrageous cases appear before the court, presided over by a young, hip, eccentric and fun-loving judge, whose views on the cases are not always normal, nor are his judgments. Logic and realism are mostly abandoned by the judge and the Kejetia Lawyers for the sake of a joke. Liezer-Legacy Productions, producers of the sitcom, are overwhelmed with the positive public response to the episodes thus far. The sitcom sits perfectly with the quest to promote local comic productions for television. “The entertainment industry has longed for something like this; different and compelling to make patrons laugh and release the stress of work and general life challenges,” said Louis. Investing in content creation has economic opportunities for production companies with unique, creative and compelling story to tell. He believes “It’s time for businesses to invest in the arts industry” to encourage production of creative and compelling content with socio-economic benefits.